Someone has added a comment on the post about tabernacles asserting that the Mass of Ages is the Ordinary Form of the Mass. Whoever wrote this has preserved his or her anonymity, so we may never know who it is. However, it does seem an odd comment to make, as the novus ordo, now often called the ordinary form, was only promulgated in 1970. Before that date, it did not exist. Prior to 1970, the form of the the Mass celebrated throughout most of the Western Church since the Council of Trent had been the Tridentine Mass. This is essentially the same as as the Mass as it had been celebrated in Rome and most of Italy since the time of St Gregory the Great. How can this contributor claim that that the Ordinary Form, with a history of just 44 years is the Mass of Ages, when the extraordinary form has been about for 400 years and arguably 1400 years. 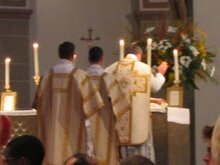 Fr Michael Brown, in his blog Gateshead Revisited, has commented on the number of personal parishes in America that have been granted to the care of the Priestly Fraternity of St Peter. I believe that there are already 30 with more expected in the autumn. We do not yet have a traditional liturgy personal parish in this country, although the Institute of Christ the King have a shrine church in New Brighton and will shortly be getting a second one in Preston. The Fraternity, of course, do share the use of a church with a regular diocesan parish in Reading. 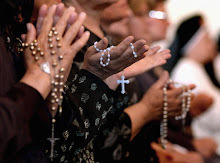 - Times are changing, however, and it may not be long before priests of the traditional orders are invited to take control of churches in other dioceses. The process may be driven along by the shortage of priests. Faced with the choice between closing a church and, inviting a traditional order of priests to take charge, it may be that, in future, bishops will be more inclined to opt for the latter. We have an example of a step in this direction in York, where Oratorians have been invited to take over the church of St Wilfrid. Maybe there will be an opportunity in Hull or Middlesbrough to do something similar, but involving one of the traditional orders. There is nothing like being optimistic! I have just read on Fr Henry's blog, Offerimus Tibi Domine, that Most Rev Thomas Paprocki of the Diocese of Springfield, Illinois has issued a directive concerning the positioning of tabernacles. He requires that in all churches and chapels of the diocese, where the tabernacle was formerly in the centre of the sanctuary, it should be returned to its original position, in accordance with the original architectural design. Only in churches where the tabernacle has never been at the centre of the sanctuary is it allowed to remain in an alternative position, and then only if it is in a visible, prominent and noble position. I often think that, if one wants to speculate on how things will be in this country in 20 years time, it is a good idea to look at what is happening in Americaat the present time. It is widely expected that the general synod of the Church of England, due to take place in York in July, will vote in favour of appointing women bishops. If this is the case, the first female episcopal appointment in the Church of England could be early in 2015. Female bishops already exist in several churches that are members of the Anglican Communion, but as the mother church of the Communion, the acceptance of women bishops in the Church of England would have particular significance for Anglican-Catholic relations. In the connection, it is interesting to note the remarks of Archbishop Welby in an interview that he gave following his recent visit to Rome. He said that "it was something that he would have to deal with" and that "it was a difficulty, rather than a serious blow to hopes of eventual unity". As far as I can discover, he did not go on to describe how he intends to deal with the difficulty, and I would not envy him the task. It would seem to me to be an intractable problem with no solution, and therefore more than a difficulty. There will be an outdoor Corpus Christi procession tomorrow (Sunday 22nd June) in York. It will follow the 11am Mass (ordinary form) at St Wilfrid's church, and so will start around midday. The blessed sacrament will be carried beneath a canopium through the streets of York. From the church, the procession will turn left into High Petergate and pass under Bootham Bar, where it will turn left again, passing along St Leonards Place before returning to the church. I have just looked at the statistics for viewings of this blog. The top ten countries for the past week are: Ukraine 182 US 117 UK 92 Germany 25 China 22 Russia 14 Sweden 11 France 9 Canada 6 Indonesia 5 Ukraine is way out in front, and other communist or former communist countries feature prominently. Has anyone any suggestions as to why this should be? The annual general meeting of the Latin Mass Society will take place in the Hall of Westminster Cathedral at 11am on Saturday 12th July. It will be followed by an optional buffet lunch (cost £5) and then by Solemn Mass in the cathedral at 2pm. Anyone wishing to take part in the lunch should book it by telephoning the LMS on 020 7404 7284. The celebrant at the Mass will be Fr Glaysher from the Isle of Wight. Rorate Coeli has a post mentioning that three deacons are to be ordained priests in France using the traditional (pre 1968) liturgies. These are to take place in Chartres Cathedral later this month and the officiating bishop will be Bishop Mark Aillet of Bayonne. From the way that the report is written, I am assuming that the three ordinands will be diocesan priests and that they come from different dioceses. If this assumption is correct, it would seem to break new ground. At least in some dioceses in France, ordinands are being given the choice between the old and the new forms, when it comes to their priestly ordination. Does anyony have any more information on this development? Nowadays, many people would think of Pope St John XXIII as a progressive pope as the associate him with the calling of the Second Vatican Council, andthe developments that ensued from that. However, the truth is very different. I have recently come across the following extract from his diary that dates to 1951 when he was the nuncio in Paris. "I went to Mass at Saint Severin. The Mass was facing the people whioch is a serious violation of liturgical law. the canon was read out loud and not secreto as the missal prescribes.... I have warned the pastor about this serious abuse... Oh, the trouble I have with these hotheads and eccentrics! The feast of Corpus Christi will be celebrated in the traditional rite at the church of St Wilfrid in York on Thursday 19th June with a sung Mass at 6pm. This will be in addition to the observance of the feast in the novus ordo on Sunday 22nd June, when there will be an outdoor procession. I note that the Dominicans are appealing for funds to train their increasing numbers of novices. There are currently 12 novices, and it is estimated that it costs £115,000 to put each student through his 7 years of training. There is to be a sponsored walk from coast to coast in July and several of the novices will be taking part. More information can be found on the GodsDogs blog. It is encouraging to see that the Dominicans, or Order of Preachers, has so many novices. There was a very beautiful Mass in St Wilfrid's Church in York for the feast of Pentecost. The Solemn Mass was celebrated by the parish priest, Fr Richard Duffield, with Fr Nicholas Edmunds-Smith as deacon and Fr Stephen Brown as sub-deacon. The musical setting was Palistrina's Missa Brevis, wonderfully sung by the Rudgate Singers. The congregation was also the largest that I have seen at the 5pm traditional Mass since it started following the arrival of the Oratorians in York. It was the most impressive Mass that I have attended for a long while, and maybe an indicator of how liturgy will develop in York under the Oratorians. On Sunday 1st June, Fr David Lashbrooke of the Torbay Ordinariate group celebrated Mass in a disused church, which the group is renting from the Methodists. The Methodist community are vacating their church in Chelston, Torbay, which is a Grade II Listed Building, and are looking for a Christian group to take it over. It is the hope of Fr Lashbrooke that money will be found to purchase the church, together with the associated buildings. Although the group has been very welcome at the nearby Catholic Church of the Holy Angels, the range of facilities at at the former Methodist church would, in the words of Fr Lashbrooke, allow the Ordinariate group to "extend its outreach to the local community". Some commentators have been saying that the Ordinariate of Our Lady of Walsingham has been stagnating in recent month, without growing at the pace that many expected. However, there are many indications that things are happening which could be the springboard for future growth. The confidence shown by the Torbay group in contemplating the purchase of a major building is one such indication. I wrote recently about meeting a young man from Sweden named Martin, whom I met at Belmont Abbey and who is active in promoting the traditional Mass in his country. Now, there is encouraging news from Denmark, where opposition from clergy is widespread. An exception is the Diocese of Copenhagen, where Bishop Kozen has shown great sympathy and has offered Mass in the usus antiquior himself. Outside this diocese, the traditional Mass seems completely absent. The Society of St Canute has been formed to promote the traditional Mass in Denmark, and we wish it every success.